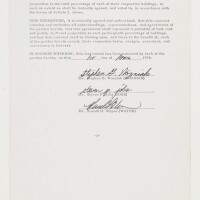 Bloomberg reports that the original founding documents establishing the Apple Computer Company, signed by Steve Jobs, Steve Wozniak, and Ronald Wayne, is set to appear at auction on December 13th at Sotheby’s in New York. 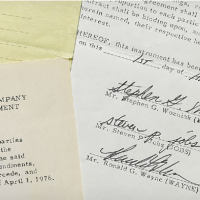 The original four-page founding contract and the legalese of their partnership was drafted by Wayne on a typewriter in 1976. In Steve Jobs, Walter Isaacson notes that Wayne left Apple just 12 days after the company was formed. He received $800 for relinquishing his 10 percent ownership and a subsequent $1,500 payment. Had Wayne held onto his shares, his original stake would have been worth an estimated $2.6 billion by the end of 2010. 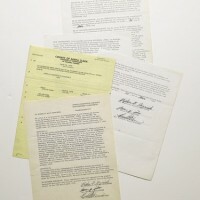 The papers documenting Ron Wayne’s withdrawal as a partner are also included in the auction package. The documents’ provenance seems to be well documented. 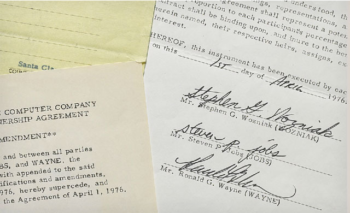 Wayne sold the documents to a manuscript dealer where an undisclosed party acquired them sometime in the mid-1990s. According to Sotheby’s, the three-page contract is expected to bring in between $100,000 and $150,000. Last November Christie’s in London auctioned an Apple 1 computer that fetched $213,600. CNN caught up with Wayne back in June of 2010 and put together an interesting short video where he explains some of his reasons for backing out of the partnership.